Timex Expedition watches were derived from the virtually indestructible 1960s infantry watches and adapted to meet the explosive growth of outdoor activities in the 1990s. Taking both styling and material cues from outdoor gear and apparel, Timex Expedition delivers reliable, accurate and comfortable watches that capture the essence of the outdoor lifestyle. 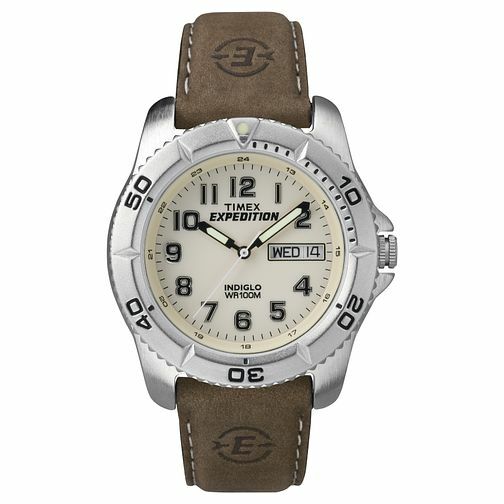 Timex Men's Expedition Brown Leather Strap Watch is rated 4.0 out of 5 by 1. Rated 4 out of 5 by Anonymous from Good value A simple basic mans watch. Easy to read. Back light function very effective at night.